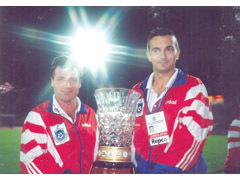 DOWN MEMORY LANE … Milomir, right, proudly displays the Premier League trophy, together with the then Sabah head coach Ronald Smith. KOTA KINABALU: Seslija Milomir has been named as the new Sabah head coach. The Bosnian will be officially unveiled anytime now. In fact, the former Sabah midfield maestro is already in the national capital, and was among those who turned up for Sabah’s Malaysia Cup playoff against Negeri Sembilan at the Shah Alam Stadium last night. Yesterday, Sabah Football Association (SFA) Deputy President Datuk Lawrence Gimbang confirmed that Milomir, who donned Sabah colours from early 1994 to 1997, will be their new head coach succeeding David McCreery, who resigned due to health reasons, last month. “We have discussed the candidates that we felt had the right attributes and we unanimously agreed on Milomir (Seslija Milomir),” said Lawrence, when met at the SFA office in Likas here yesterday. It was believed that Milomir was among the list of candidates that were eyeing the Sabah hot seat following the departure of McCreery. Among them were former Perak coach Toni Netto, who too has had an impressive record with Perak. “I have contacted him and asked him whether he is willing to come to Sabah, and he agreed, and he even says that he is half Sabahan. In fact, one of his two sons is born here in Sabah,” Lawrence added. “We have agreed terms, and now it is only a matter of putting pen to paper. He is already in Kuala Lumpur. He arrived on Tuesday night, and we will finalise the deal once he arrives here in Sabah,” Lawrence said, adding that, SFA has offered Milomir a one-year contract, without elaborating. “We will give him a full mandate or rather free hand in managing the team without any interference from outside. On our part, we will support and assist him from behind,” he said. Milomir, who turns 49 on July 21, made his M-League debut with Kuala Lumpur in 1992, and the following year, he signed for Sabah until the end of 1997. While with Sabah, he was part of the side that won Sabah’s first ever FA Cup title in 1995 and he was also part of the Golden Squad, albeit with a capacity as player-coach, that lifted the country’s top division league then known as the Premier League in 1996. And Milomir is surely the fans’ favourite, but he is braced for the tough job in turning Sabah into a formidable force in the Malaysian football scene!